Home Opinion DETAILS AND HISTORY OF METHODICAL KILLINGS IN RWANDA! DETAILS AND HISTORY OF METHODICAL KILLINGS IN RWANDA! Heartbreaking news about the assassination of Hassan Ngeze’s son spread across social media yesterday on 16 June 2018. The corpse of the late was found in JPton Hotel where he and Rwandan diplomats from Rwandan Embassy in South Africa had arranged for an encounter. After the assassinations of Colonel Theoneste Lizinde in Nairobi, Kenya (1997), Minister of Interior Affairs Seth Sendashonga in Kenya (1998), Major Cyiza Augustin disappeared in Rwanda (2003), Father Evariste Nambaje from Cyangugu Diocese strangled in his jeep (2014), Lawyer Donat Mutunzi strangled in a police cell in Kigali (2018), etc the son of Hassan Ngeze was also killed simply because he was a Hutu. Let us recall that the RPF started its methodical killings to eliminate the Hutu elite when it murdered Emmanuel Gapyisi and Félicien Gatabazi in the early 1990s. Both men were Hutu and they were high profile politicians. It is clear that the RPF regime continues to cleanse the Hutu ethnic group’s citizens on the grounds of their ethnic identities. In the RPF’s ideological architecture, the Hutus must not advance socially and the latter ought to be subjected to drudgery as they used to be during hundreds of years under the harshest rule of the Tutsi royal monarchy. On the international stage, President Paul Kagame is credited with halting the extermination of hundreds of thousands of Tutsis, the ethnic group to which he belongs. Kagame’s supporters often overlook his authoritarianism and point to the clean, efficient-looking Capital City of Rwanda (Kigali) that his Tutsi-led government of the Rwandese Patriotic Front (RPF) has built from the ponds of innocent blood in Rwanda and in the Democratic Republic of Congo. But as Canadian investigative journalist Judi Rever, Belgian scholar Filip Reyntjens and journalist Peter Verlinden have shown, his rule is beyond authoritarian Idi Amin Dada’s. It is predatory and comparable to Adolf Hitler’s Nazism. Kagame’s legacy is based on myth and he evidently uses the 1994 murder of Tutsis as stock in trade to justify his military operations, and presidency for life. It is not surprising that today there are some Hutu officials in the Kagame administration for the sake of exhibition as was the cases for Anastase Gasana and Faustin Twagiramungu. These men revealed it earlier and they took the way to exile together with Tutsi officials like Joseph Sebarenzi who denounced the perpetration of injustice towards Rwandans, especially the Hutus. It is in that context of murderous conspiracy that the Tutsi Colonel Patrick Karegeya was strangled by Kagame’s DMI operatives in South Africa and so many other Tutsis were disappeared in Uganda killed by the same DMI agents. Ethnic cleansing against the Hutu ethnic group began in the 15th century when Hutu kings were murdered one after the other. During that epoch, lots of kings were slaughtered including King Nzeli who was slain from the plot mounted by Ruganzu II Ndoli (a Tutsi monarch of the early 1510s CE), King Mashira of Nduga was assassinated by his brother-in-law Mibambwe, King Kabega who hosted the Tutsi dynasty of Abanyiginya ended up getting murdered by his Tutsi guests, King Kimenyi of Gisaka was assassinated by Tutsi conquerors, King Biyoro of Ndorwa was murdered by Kigeli IV Rwabugili and many more kings of the North were killed during the era of German colonialists because these Europeans supported the kingly rule then headed by Yuhi IV Musinga (1896-1931), son of Mother queen Nyirayuhi Kanjogera from Abega clan and grandmother of Paul Kagame. The Hutus took a relief from the yoke imposed to them by the Tutsi monarchs at the end of World War I when Germany lost her African colonies to the profit of the victors as it was determined by the Versailles Treaty of 1919. In the vintage point of the Belgians it was impossible to consolidate Rwandan economy while the Hutus being 85% were oppressed. Then the Belgians ordered King Mutara III Rudahigwa to abolish the drudgery and all Tutsi privileges connected with social inequalities, events that led to the overthrow of the Tutsi monarchy in the popular revolution of 1959. However, the Tutsis did not like the rule of the republic in Rwanda, and hence they excited riots in the streets murdering the Hutus. The Hutus riposted vigorously enough to defeat their persecutors and the Tutsis fled to the neighboring countries in order to get well organized and come back with a much tighter dominion than before. It is in this context that in 1993-1994 three Hutu Presidents namely Juvenal Habyarimana, Cyprien Ntaryamira and crew were killed shot down in a plane while they were returning home from the Arusha Peace Talks. Melchior Ndadaye (first Hutu Burundian President) was murdered cut into pieces by Kagame himself the previous year on 20 October 1993. After the assassination of President Juvenal Habyarimana, Major General Paul Kagame’s death squads methodically slaughtered Hutu intellectuals and peasants. His mobile forces worked behind the battlefield, luring Hutu civilians to meetings, shooting or killing them with hoes known as “foka-foka”, and burying them with Tutsi victims. When the victims became too numerous, Paul Kagame’s killing units quietly loaded families onto trucks and carried them to a remote park where they were hacked, shot, burned and incinerated. History will record it as a mass murder without a trace. Let us highlight that President Laurent Désiré Kabila of DRC and a number of clergymen including priests and bishops were merely murdered because they disagreed with the RPF regime over the perpetration of mass killings and stirring political and economic instability in the Great Lakes region, notably in DRC. Kagame’s intelligence agents murdered two Québécois priests, Claude Simard and Guy Pinard, in 1994 and 1997. Both men dearly loved Rwanda and denounced RPF crimes against Hutu civilians in the aftermath of the genocide. 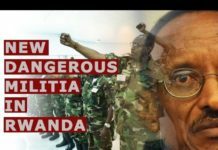 Since his power takeover on 19 July 1994, Paul Kagame has waged a war against the truth targeting dissidents and witnesses abroad who dare to expose his true record. In 2005, two Canadian investigators working for the United Nations, Richard Renaud and Réjean Tremblay, collected testimony from a former member of Major General Paul Kagame’s intelligence network who said that senior RPF officials held an important meeting a week before the plane attack to “prepare for a big battle and a major cleansing of the Hutu population.” The UN rapporteurs also found that the troops of President Paul Kagame may have committed genocide against Hutu refugees in Congo in 1996 – 2003. When a Hutu citizen politically or intellectually grows important, the RPF regime hunts him down from wherever he may be in the world. It is in that way the deputy inspector general of Ugandan police Andrew Felix Kaweesi was assassinated at Kulambiro in Kampala on 17 March 2017! The late Kaweesi was killed because he was born from a Hutu father and a Ugandan mother, and besides that he was said to be the replacement of his boss inspector general of police Kale Kayihura, a Tutsi from Bufumbira who cooperated closely with President Paul Kagame and his death squads. In 1999, a publication explaining the details of the meeting held before the creation of IBUKA was released in the paper “Le Prophet.” As it was in that writing, IBUKA aimed to know the whereabouts of the Hutu intelligentsia, especially the youths, whether at home or abroad so as to adopt the strategies to downgrade them whenever it’d become remarkable that they have achieved success either intellectually or economically. It is in this case that the son of Hassan Ngeze was murdered in Johannesburg, South Africa this weekend. Those who oppose themselves to the injustice perpetrated against Rwandans, notably the Hutus find extrajudicial execution as to their clean conscience. It is by this very fact that a large number of right minded Tutsis risk their lives and flee the country day after day. Here one can state the names of Assinapol Rwigara and Colonel Patrick Karegeya who are already assassinated, Déo Mushayidi, Kizito Mihigo and Diane Rwigara who are in jail, Dr Théogène Rudasingwa, Dr David Himbara, Gérard Gahima, Noble Marara etc who have fled the regime of the serial killer Paul Kagame. It is undoubtedly clear that the Kagame administration continues to perfect the methods to annihilate the Hutu ethnic group even the Tutsis who denounce the ongoing extermination of the Hutus. The Hutu intellectuals are pursued night and day while the Hutu peasants are starving to death. 40% of Hutu children under the age of 6 have stunted and nonetheless the government of the RPF begs foreign aid in their name. Such is an inhuman scheme of nipping those flowers in the buds and ban them from achieving any development and thus reduce them to historical retards! If the Hutus who studied law and politics are killed only because they were born Hutu, if the children get stunted because their parents are deprived of the financial means that would help them run their households and solely because they are Hutu, this may take no other appellation than ethnic cleansing against the Hutus. The regime of the RPF should be brought to justice to answer about the crimes of genocide it rampantly perpetrates against Hutu nationals. It is the continuation of a long story of mass destruction which messed up our civilization since the beginning of the Tutsi royalty. We are asking the UNHR and friendly countries to halt the crimes against humanity committed to the Hutu majority by the RPF regime. World Powers like France say that to support the regime of the RPF is to prepare for a better future but that is contrary to the truth. You cannot prepare for a better future unless you encourage the truth. Nor can you build a better future while you ignore that the countrymen are oppressed. The fact that the international community has backed the tyrannical regime of President Paul Kagame added fuel to the insecurity in the region and now the low people’s lives languish in abject misery. This doesn’t prepare a good future either for foreign investors or for the natives. Every economy goes inseparably with security and it is common knowledge that General Paul Kagame and the RPF cannot secure Africa’s Great Lakes region. The PRA Group for Democracy carried out research and found out that the regime of the RPF is the catalyst for insecurity in the Great Lakes region. No economic goals can be reached as long as Kagame and his RPF aristocracy are in power. The PRA Group for Democracy stands for the truth and democracy in Africa’s region of Great Lakes. We join hands with all men and women widowed by the RPF, all children orphaned by the RPF and all families that continue to lose their loved ones because of their ethnic backgrounds. Let us remember that since the murder of Colonel Patrick Karegeya, Ngeze is the third Rwandan killed in South African hotels. Let us remember that lawyers from the Hutu ethnic group are targeted and continually murdered! So, now we are asking the international community and the main friendly countries of Rwanda to act in the light of the truth and reject the manipulations of the extremist regime of the RPF that wants to persecute the Hutus and moderate Tutsis from wherever they are on the earth.